It is not true that all the eight subsidiaries of SBIC suffered losses or went bankrupt as previously thought by many. For instance, Song Cam Shipbuilding Joint Stock Company has enjoyed profits for several straight years. In the restructuring plan Song Cam submitted to the ministry, there is no debt needed to be settled. On the contrary, its revenues in three consecutive years, from 2010 to 2013, jumped from VND814.5 billion to VND1,004 billion. Last year, the company gained VND90.6 billion in profit. This year’s target of Song Cam is to transfer a 70% stake held by the State to Dutch shipbuilder Damen Shipyards Group. Song Cam entered a joint venture with Damen for ten years and their ships have been exported to several countries around the world. Damen also intends to buy into Halong Shipbuilding Co, Ltd after the local company completed its restructuring process. However, Halong belongs to the seven remaining enterprises that need to restructure debts. In 2013, the firm suffered losses of nearly VND400 billion. Meanwhile, among 16 subsidiaries of Bach Dang Shipbuilding Co, Ltd, the parent company must divest capital from five firms and transfer five others to SBIC. Enterprises under SBIC have already finished the first step in the financial restructuring process, helping them clear 70% of their debts. They are now restructuring their debts as well as undergoing equitization. As planned, SBIC must complete the financial restructuring and equitization processes at three enterprises including Chan May Port Co, Ltd, Halong Shipbuilding Co, Ltd and Cam Ranh Shipbuilding Co, Ltd. SBIC and the remaining firms must finish the equitization process next year. 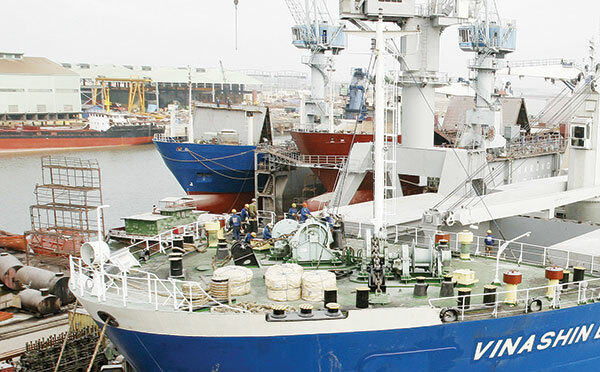 Among 200 enterprises established by Vinashin previously, only one has been handed over to the State Capital Investment Corporation (SCIC) and another transferred to Debt and Asset Trading Corporation (DATC) under the Ministry of Finance.